There is an age old argument about puppy classes between dog trainers and veterinarians. I am blessed that most vets in Miami agree that you absolutely cannot wait until a puppy is fully vaccinated to start the socialization process. The critical window for socialization (12 weeks) closes way before your puppy will ever finish it’s vaccines. So, for our puppy classes, we require that pups have at least one set of vaccines 10 days prior to the start of puppy class. In the 10 years we have been running puppy classes in Miami-Dade County we have had three reports of bordatella and one parvo scare. The three reports of bordatella likely originated from outside our puppy class, and the parvo scare was just a scare. We canceled classes that night as a precaution, but after disinfecting our training space we were made aware that the puppy did not have parvo after all. In all four incidents of sick puppies, their owners did their due diligence in contacting us to let us know they wouldn’t be bringing their puppies to class that week. We do our part to keep our training space clean, but we also trust that our dog owners are doing what is necessary to protect their puppy outside of class! Think about it: we have had four incidents in 10 years. That’s four puppies out of approximately 2,000 puppies. That’s less than 1% of all puppies that come to us for puppy classes… 0.2% to be exact. Ian Dunbar would be proud! What we tend to forget is that, puppy class is not the only potential source for infectious disease. You could just as easily bring an infectious canine disease in on your shoes/clothes to your puppy at home! Working with shelter dogs, this has personally happened to my own dogs. THey all got bordatella, and man, it sucked. But, they all got treatment early, got better and life went on. Moral to the story? Your puppy is never 100% safe from the risk of catching something. Not during puppy hood, not in his adult life. If he’s going to be a social butterfly, there is also risk of infectious disease. Yet, in our puppy classes, we do our best to make sure that our classes are as clean and safe as possible to ensure the health and well being of your puppy. That is what is most important to us. Below is an article from the APDT’s Chronicle of the Dog Magazine. We encourage all of our clients interested in enrolling in our puppy classes to read this article by veterinarian Jennifer Messer. Ultimately you have to decide what’s more important to you. We know, with certainty, that early socialization IS CRITICAL. As pet owners ourselves, attending puppy class is always worth that small, small risk. Are Early Socialization and Infectious Disease Prevention Incompatible? mental well-being. Puppy wellness depends on many factors, including genetics, nutrition, protection from parasites and infectious diseases, grooming, intellectual stimulation, exercise, socialization, and a loving and safe environment. When a puppy is both physically and behaviorally well, he is more likely to meet the expectations of his human family and is at decreased risk of re-homing or euthanasia. has been advised to restrict the puppy to the house and the yard, until completion of his vaccination series, in order to protect him from infectious diseases until he is well immunized, which can mean virtual isolation from the outside world until over four months of age. However, the window of opportunity to most effectively socialize a puppy is fully vaccinated, and delaying vital socialization often has negative long-term behavioral consequences. Research shows that lack of early socialization increases the likelihood of behavior problems such as fear and aggression. the everyday elements of their environment.1 This prevents them from wasting energy by responding fearfully to the common events and encounters of their day-to-day life. still necessary? This “traditional” approach is based on the limitations of vaccines being used two decades ago. Vaccines have improved significantly in the last 15 years, as has our understanding of the importance of early socialization. Let us then re-examine traditional recommendations in the light of modern advances in immunology and insight into canine behaviour development. it becomes increasingly difficult to successfully socialize a dog. Once the dog reaches 18 weeks of age the window of socialization closes and it is then much harder—and sometimes impossible—to train a dog to like something new or acclimatize him to something that he finds frightening. Poorly socialized dogs are at much greater risk for responding fearfully to unfamiliar people, dogs, and experiences. Puppy classes—the brainchild of Dr. Ian Dunbar—were developed as a way of enabling puppy socialization and training in a friendly and safe environment. In a typical puppy class off-leash play and play-fighting helps socialize puppies to other dogs and allows them to learn to be gentle with their jaws, handling exercises acclimatize them to being touched by strangers, and exposure to odd sights and sounds (using props, CDs, and theatrics) accustoms them to a wide range of life experiences. Between socialization activities, topics such as house training exercise, and environmental stimulation are addressed with owners and the puppies are taught some basic obedience skills. Puppy classes help puppies achieve wellness by facilitating socialization and by teaching the puppies’ guardians how to assist the puppies in acquiring skills that are expected of them in order for them to be cherished members of their human family and of society. Since puppy classes are so important to the lifelong well-being of puppies, it is crucial that as many puppies as possible attend them. Despite this, many owners are discouraged from enrolling their dog because of recommendations from breeders or veterinarians who argue that puppies should not be exposed to other dogs until their full vaccination schedule is complete, something that doesn’t occur until after the puppy is 12 weeks old, when his peak socialization period has already passed. Puppy owners, faced with balancing the very real threat of their puppy becoming seriously ill against what may seem to them to be the nebulous benefits of puppy classes, cannot be blamed for choosing to keep their puppies at home. Yet, the relative risks have changed with improvements in vaccines. Although vaccination does not guarantee protection from disease, newer vaccines allow more reliable protection at a younger age. his lifestyle, and his health status. Puppies in North America are generally vaccinated against at least five infectious diseases: distemper, hepatitis, parvovirus, parainfluenza (these four are often administered as one combination vaccine), and rabies. Depending on their risk of exposure, some puppies are also vaccinated against leptopspirosis,10 Bordetella (kennel cough), Borellia burgdorferi (Lyme disease), and other disease agents. Of these, the disease that is usually of greatest concern when considering early exposure to other dogs is parvovirus. The reason for this is threefold: the virus is incredibly resilient in the environment, the disease is severe, and the older vaccines were not very reliable at providing protection in young puppies. To understand why the older vaccines were less reliable, you must first understand something of how vaccines work. Antibodies are special proteins made by the body to neutralize disease before it can cause harm. A puppy gets maternal antibodies from his mother, partially through their shared blood supply while the puppy is still a fetus, but mostly through the milk he suckles from her after birth. The type and amount of maternal antibodies a puppy gets depends on his mother’s immune system, i.e., what diseases and vaccines she’s been exposed to in her life. Maternal antibodies are temporary; they gradually break down and disappear completely by the time he is about four months old. In order to have lasting immune protection, the puppy’s immune system needs to make its own antibodies. The puppy’s immune system can be stimulated to make antibodies in one of two ways: the puppy can be exposed to the disease and risk getting very ill, or he can be vaccinated against the disease. Vaccines are made with weakened, altered, or killed disease agents—still close enough to “the real thing” to stimulate the production of antibodies, but not capable of causing the disease itself. The first time the body meets either the real disease or the vaccine against a disease it makes some antibodies, and the cells of the immune system register that they have encountered that particular disease intruder. When the puppy gets his next dose of the vaccine a few weeks later, his body makes many more antibodies even faster and an army of memory cells is made, ready to fight the disease at the drop of a hat if needed in the future. At this point, there is long- lasting immunity—up to a year for some disease agents, much longer for others. The windows of vulnerability used to pose a huge problem with regards to parvovirus in puppies. In recent years these windows have become much smaller and, therefore, less problematic because the newer vaccines are much better at stimulating the immune system even while the puppy still has maternal antibodies in his system. These newer vaccines are called “high-titer, low-passage” vaccines because the disease substance used in making the vaccine is put through fewer “passages” to weaken it and, therefore, the vaccine product is capable of stimulating the immune system better, resulting in more antibodies being made (measured as a “titer”). Even the breeds that have historically been more susceptible to parvovirus, such as the black- and-tan-coated breeds, don’t seem to be at increased risk anymore when the newer, “stronger” vaccines are used. Before the “high-titer, low- passage” vaccines11 were introduced, the likelihood of maternal antibody interference in young puppies was much greater, and it was quite common for puppies to receive vaccinations at eight, 12, and 16 weeks of age and, sometimes, even a final booster at 18 to 20 weeks of age for puppies at increased risk. 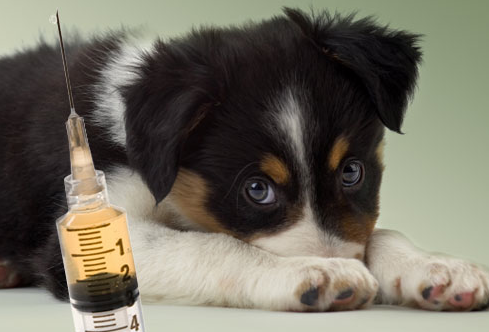 Both manufacturers of the newer vaccines and independent investigators have demonstrated that three doses of the high-titer, low-passage vaccines given at six, nine, and 12 weeks of age are at least as effective at immunizing a puppy as were the older vaccines given at three-week intervals until the puppy was 18 to 20 weeks old. This is reflected in the American Animal Health Association 2006 Vaccine Guidelines, which now recommends vaccinating puppies starting at six to eight weeks of age and revaccinating every three to four weeks14 until the last dose of vaccine is given at 12 weeks of age or older. With an accelerated schedule (starting at six rather than eight weeks of age) using the newer vaccines (high-titer, low-passage), puppies can now be effectively vaccinated at an earlier age. While this should have paved the road to getting puppies into socialization classes while the window of socialization is still wide open, there still is great hesitation in the veterinary, breeder, and training community to encourage the attendance of puppies under 12 weeks of age in these classes. While it has long been recognized that behavioural illness kills more dogs than infectious disease, the first veterinary expert to promote getting puppies into socialization classes after a minimum of one vaccination was Dr. R.K. Anderson, a veterinarian, board certified in both population medicine and behaviour. In an open letter to his colleagues titled “Puppy Vaccination and Socialization Should Go Together” he emphasizes that we have a responsibility to enable early learning and socialization in young puppies, and that they should be enrolled in a socialization program as a key part of any preventive medicine program. Dr. Anderson concludes by stating that 10 years of good experience and data with few exceptions allows veterinarians to generally recommend early socialization and training classes, beginning when puppies are eight to nine weeks of age. There have been no puppy class participants infected with Parvovirus in any puppy classes offered at Ohio State [where puppies 8 to 16 weeks can enroll] or Purdue University, and these are both facilities that treat high humane society caseloads and numerous Parvo[virus] cases annually. For over ten years at Montessaurus Puppy School in Guelph, Ontario, Canada, we have been accepting puppies from eight weeks of age with a minimum of one vaccination against parvovirus and distemper. The additional precautions we take are simple: owners are asked to keep their pup at home if he is unwell or has diarrhea, and the floor is cleaned with a dilute bleach solution if a puppy defecates in class. We have not had a single incident of suspected infectious disease transmission to this day. There is a growing consensus that puppies are NOT getting ill in puppy classes that enroll puppies who are seven weeks and older and who have been vaccinated at least seven to ten days before starting class. However, this is not to suggest that young puppies should be exposed indiscriminately to other dogs and outdoor areas. It is still prudent to avoid exposing a puppy to dogs of unknown health status, or to parks and other areas likely contaminated with dog feces until the puppy is fully vaccinated. In regions where parvovirus is rampant, or where other infectious disease agents may be present, it may even be warranted to keep the puppy from walking on public property until fully vaccinated. Keep in mind that socialization to dogs is but one aspect of socialization, and that puppies can be safely exposed to people, places, sights, smells, and sounds without significant risk of exposure to infectious disease. Drive to a busy mall and hang out with your pup on a mat at the entrance. Strangers will flock to you, manhandle your pup, and willingly feed him treats. Host a puppy party: invite friends and family over, play some music, toss some streamers, and pass your pup around. Bring your puppy to indoor Scouts or Brownies meetings. Supervise children interacting with him. Play sound-desensitization CDs or cassettes. A whole range of everyday noises such as sounds of motorcycles, stormy weather, and crying infants are available. Feed lots of treats for scary noises. Park yourself with your puppy at an outdoor café along a busy street. The puppy can rest on a pillow/bed at your feet. Allow strangers to pet your dog, and offer him biscuits. Take drives to different parts of town and country with your pup safely seatbelted in the back seat. Visit countryside, different neighborhoods with people of various ethnicities, and go through the carwash and some drive-thrus. Have the window open so that he can take in all of the sights and sounds and smells (car wash excepted!). Take your puppy for long strolls tethered in a wagon, stroller, or body sling (depending on size/weight!). Puppyhood remains the single greatest opportunity to positively influence a dog’s behavioural development. Since more dogs are euthanized for behavioural reasons than for all medical causes combined, it would be unwise to allow unfounded fear of exposure to infectious disease to interfere with efforts towards early socialization. Advising puppy owners to wait until the puppy is over 12 weeks of age before exposing him to the world he will be living in might have been appropriate a decade ago but is now clearly outdated. In striving towards puppy wellness, socialization and infectious disease prevention must go hand in hand. This article is intended to provide general information on the topic of vaccination of puppies, socialization of puppies, and the relative risks of behavioural illness and infectious disease when puppies are exposed to other dogs before the completion of their vaccination series. The information contained within is not intended as veterinary recommendations, and should not replace the advice of your veterinarian. extent to which environment affects behaviour is determined by genetics, which cannot be influenced after conception. Dog and Cat, 2nd Ed., Elsevier Saunders. 3. Horwitz, D., Mills, D., & Heath, S., eds., (2002). British Small Animal Veterinary Association Manual of Canine and Feline Behavioural Medicine, British Small Animal Veterinary Association. 4. Lindsay, S.R. (2001). Applied Dog Behavior and Training, Volume 2: Etiology and Assessment of Behavior Problems. Iowa State University Press. Canine Behavior: A Guide for Veterinarians. W.B. Saunders Company. 6. Scott, J.P. & Fuller, J.L, (1965). Genetics and the Social Behavior of the Dog. University of Chicago Press. in companion animal behavior. Veterinary Clinics of North America: Small Animal Practice. 27(3):465-477.
in the chapter titled “Early Experience and the Development of Behaviour” by James Serpell and J.A. Jagoe in The Domestic Dog: Its Evolution, Behaviour and Interactions With People edited by James Serpell, (1995) Cambridge University Press. of Behavior Problems of the Dog and Cat by G. Landsberg, W. Hunthausen, and L. Ackerman. for leptospirosis due to the higher risk of adverse reactions in younger puppies. 11. “Vaccines” in this section refers to distemper, hepatitis, parvovirus, and parainfluenza (usually administered as one combination vaccine). 12. Smith-Carr, S., Macintire DK, & Swango, LJ. (1997). Canine parvovirus. Part I. Pathogenesis and vaccination, Compen Contin Educ Pract Vet 19(2):125-133. 13. 2006 American Animal Health Association Canine Vaccine Guidelines available at www. aahanet.org. 14. I consider it worthwhile pointing out that although the immune system responds to boosters in the same way, regardless of whether they are done ten days apart or four weeks apart, the vaccine manufacturer will make a recommendation on the period between boosters for their product based on the research conducted in the process of having their vaccine product approved [personal communications with vaccine manufacturers]. Veterinarians will generally want to follow these recommendations. This is why some vaccines are boostered at two to four week intervals, and others at three to four week intervals. 15. Rabies is administered only once to puppies at least 12 weeks of age. Because of the risk of rabies to humans, the rabies vaccine is made to be so strong that the puppy only needs one exposure to it. 16. Open letter by Dr. R.K. Anderson posted on many Internet sites, including www.apdt.com, and available upon request through the University of Minnesota; phone (612) 644-7400. 18. Dr. R.K. Anderson, DVM, DACVPM, DACVB is a professor Emeritus, College of Veterinary Medicine; Past Director, Animal Behavior Service of the College of Veterinary Medicine and Current Director, Center to Study Human Animal Relationships and Environments, University of Minnesota. 20. Your veterinarian can advise you of the incidence of parvovirus in your area. 21. For example, leptospirosis is transmitted through the urine of an infected animal and can be ingested through contaminated water. to routine clinical medicine, she conducts private canine behaviour consultations and has implemented an in-clinic puppy parenting program to educate dog-owning clients about puppy behaviour and training. She is well recognized as a leader in curriculum development for young puppies, and her comprehensive puppy class program The Kinderpuppy Course: A Curriculum Manual for Instructors, available at www. pavski.ca, is being used by puppy class instructors across North America. Jennifer is owned by her Staffordshire Bull Terrier Monte, and her Pit Bull Terrier Charlotte, who live with her on her farm in Southwestern Ontario. She can be reached at jmesser@sympatico.ca. This article was first published in the November/December 2006 The APDT Chronicle of the Dog. Copyright 2006 The Association of Pet Dog Trainers, www.apdt.com, 1-800-PET-DOGS.